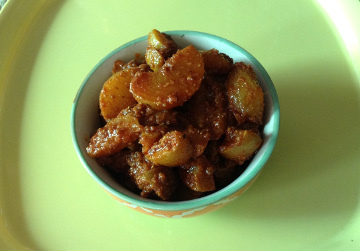 Instant Amla pickle or gooseberry pickle is a favorite winter food recipe as you can start eating it as soon as you make it. There is no need to wait for the pickle to mature. As amla or gooseberries are available in winter, you can make and start using it immediately. Amla / gooseberry is known as amalaki, avla or awala (Hindi / Marathi), nellikai (Kannada). 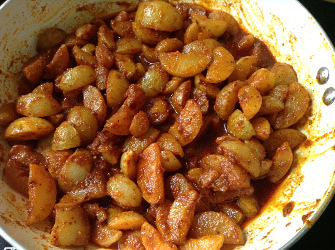 You may also follow the traditional amla or gooseberry pickle recipe usually takes about a week to get ready to eat. Amla is also eaten by itself. Many enjoy it's sour taste. Did you know, if you take a sip of water after eating amla, water tastes very sweet. For this pickle, use spotless, juicy, large amlas or gooseberries. Wash them thoroughly and dry them well. Any remaining moisture may spoil the pickle. Large Amla or gooseberries - 10. Grind or pound to fine powder mustard seeds, fenugreek seeds. Wash amla and dry them well. Cut amla in pieces, small or large, as you wish. I usually cut them on the visible lines. Remove and discard the seeds. Heat Oil in a stainless steel pan/kadai. Add amla - gooseberry pieces to hot oil carefully. Be careful as they may splatter. Let amla pieces cook in oil for about 10 minutes or till the pieces soften a little. Add the ground fenugreek/methi and mustard/rai powder, asafotiea/hing powder, red chili powder, salt, turmeric/haldi powder to the cooked amla. Mix well and continue cooking for 2 minutes. Cool completely before adding to bottle. Fill in dry airtight bottle. Amla or gooseberry Pickle is ready to eat. Serve with any dish such as snacks, rice, roti, poori etc. It is best with curd rice. It is also good to just lick on a piece of amla pickle at any time you feel like. You may use mustard oil or any other vegetable oil according to your choice. You may add more salt or red chili powder according to your taste. You may add black pepper powder, ajwain seeds, fennel seeds for variation if you wish. Using more oil is useful to preserve the pickle longer. A layer on oil on top in the pickle bottle keeps pickle good. While taking pickle out from the bottle, take out only the pickle pieces out and leave the oil in the bottle. If you give a stir to the amla pickle once in 2-3 days, you do not need to store the pickle in the fridge. Every time I take some pickle out, I stir it with a dry spoon. I usually leave it on the kitchen counter so as to remember to stir it once in a while.